So that is what I am often doing in playing with LP…paying attention to what delights, frustrates and inspires her and “feeding” her imagination more of that. Within this process, repetition is often my friend. 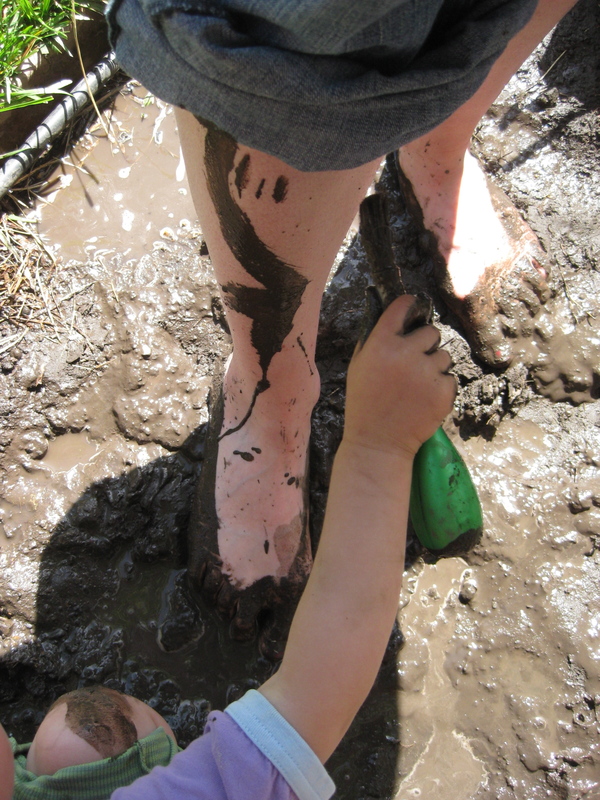 My girl loves to get her whole body into an experience, so as long as I’m in the mood for mess, painting or mud play never grows old. Even in storytelling, repetition is great. We return to favorite characters and sometimes move them into new situations and experiences. All good stuff ~ taking what I know inspires and offering more opportunities to explore. AND I am a limited resource. Our imaginations have boundless potential but we need to keep experimenting with what to feed them to see what leads us to explore new realms. There are ways that my life these days is much smaller than it used to be (in terms of external stimuli) and simultaneously much more intense internally. To give LP and myself new “food” can be a challenge. The incredible generosity of parent blogs has often provided inspiration as do seeing what other folks do with their kids when we are out in the world. And books, books, books. I’ve been trying to deepen our weekly library trips by talking about what she wants to read/learn about and delving more into nonfiction kids books. Also to mix up books that I’m drawn to with books that LP pulls off the shelf (usually because the cover is red). Last week, ImprovDad took LP to the library and when I looked over the books he chose, I had an “a-ha!” moment. New material to feed our imagination was easy to come by….sometimes have someone else select the books. ImprovDad is attracted to different stories and aesthetics than I am and it was refreshing for my imagination too! 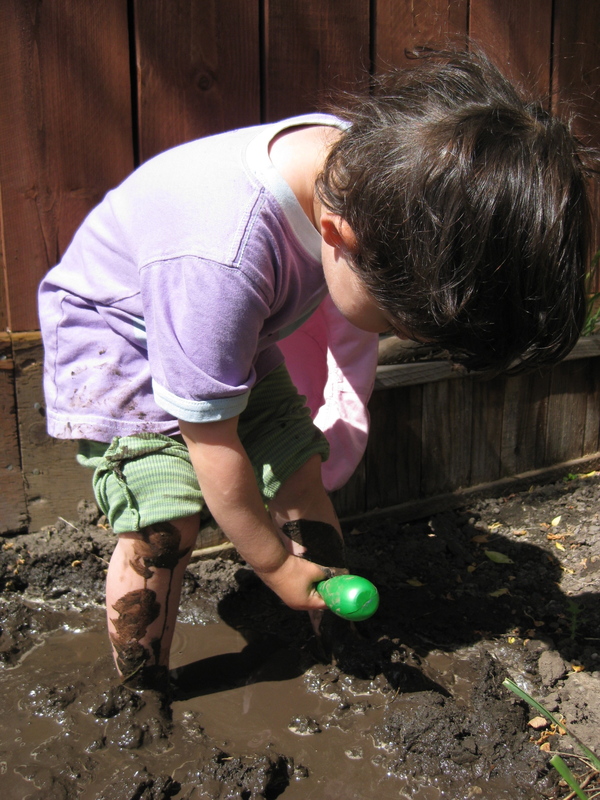 How do you find new ways to feed your and your little people’s imaginary beasts? Ah, the wail of the Little Person. Where did this come from? I wasn’t expected that kind of reaction for a number of years yet. For the most part I find it really hard not to laugh at this one. It is so over the top. Part of my reaction is to understand it as her wanting me to do it for her and I’m trying to give her many opportunities to do for herself these days. Yet as I kept wondering about where that reaction came from, I stumbled on my own inner wailings about “nothing.” (or “NOTHING!”) I get it kiddo, I am familiar with feeling that I have “nothing.” As I struggle with editing and revising my novel, I come up against it all the time. Here’s this world I’ve created that needs a ton of work to get more fully out of my head and on the page and yet, I have NOTHING to write. It is true. When I’m not inspired, I have nothing to write… or cook for dinner…or dream plan about in a quiet moment. Now I know that inspiration isn’t just about some magical muse moment. In improv, inspiration is taking a deep breath, opening your eyes to take in what is present and allowing yourself to go with what comes next. Sometimes what comes next is magical and sometimes it is mundane. The important thing is embracing that something comes next and allowing that something to exist. Yes, LP, sometimes it really does feel like there’s nothing. And that’s when we need someone outside ourselves to help us go look. This post is part of the Moms’ 30 Minute Blog Challenge…written in 5 minute increments over 4 days. I’ve struggled with bouts of insomnia for as long as I can remember. Being mama to a challenged sleeper has been hard with bouts of being ridiculously hard. Recently we got blackout curtains for our room and her room. All of sudden, my sleep is significantly better (and at first, hers was too). It is miraculous! I never would have thought that our room is particularly light at night but these have cut my insomnia awake time in half. Which unfortunately (for her) leads me to be way more grumpy with my little night owl. Who is (knock on wood) nearing the end of a phase of not wanting to sleep (at all). One of the ways I’ve been helping her settle down is with a story about 2 ducklings we saw at a local farm last week. These two ducklings, Peep & Squeek, are about 2 weeks old were recently rescued and brought to the farm. When we saw them they were happily swimming round and round and round in a little pond eluding every effort of the farmer to catch them. When he did catch them up (and let us and the other folks watching pet them and say hello up close), he put them in their “bed” (a large washtub with straw and a light for warmth). Within minutes they were curled up asleep. LP loves to hear this story and it has been part of our bedtime ritual the past few nights. It was a great “a-ha” moment for me when it occurred to me to tell her this real life story. I realized the story could be a metaphor for her and that she might relate to those ducklings who are so tired but don’t want to stop playing. I tell it pretty straightforwardly ~ it can be very tempting to emphasize the moral of the story but you know, I think she gets it without any emphasis. I wrote about my friend Carla’s blog a few months ago here. Her ALS has progressed and she is no longer able to eat which means she has very little time left. Carla posted her final blog entry a few days ago. I’ve read it a bunch of times (cried each and every time) and I wanted to share it with the small world of improv-a-mama readers. Carla, I will miss you. The days can be long and for me, dinnertime is often the longest part of day. I think I’m hyperaware of all the ways that family dinner (meaning eating together and having conversations) are important and good for kids. So I want to make that happen. Yet there are many evenings that ImprovDad’s work prevents him from being home for dinner. So it is we two, LP and me, having dinner together. Truly, I think I’ve always found meals challenging with LP. She’s slooooooooow eater. So on most days of the week, when dinner rolls around, we’ve already had two meals together. And snacks. And spent most of our time together. I have nothing to talk about. Sure I try to get a little something going about a part of the day that each of us enjoyed and a part that was challenging. And tonight, finally it dawned on me. Why not tell stories during dinner? So after we talked about our day (for about a minute and a half), I told LP stories about the Goat who Liked Spaghetti. This character was inspired by what was in front of me, my little girl who will try to eat pretty much anything she finds in nature who was eating spaghetti. There were 4 or 5 simple stories. One was about the Goat who Liked Spaghetti picking flowers for her mama. Then they ate them for a snack. Another was about when the Goat who Liked Spaghetti woke up in the night and got up to eat the leftover spaghetti. LP was happy and I was happy. We stayed engaged with each other and I did not get restless. Dinner was eaten and we even had enough time before bedtime to go outside for one more round of gardening.